We get asked a lot as an SEO company what people should look for when hiring a San Diego SEO Expert. Well with San Diego being one of the most competitive SEO landscapes in the world one of the major things we would mention is experience in the industry. The unfortunate part about the SEO industry is that there are a lot of self-proclaimed “Seo Experts” that are often time reselling the services of the true experts. We pride ourselves at Local Blitz for keeping all the work in house and continually educating ourselves on the newest changes in the Google platform and putting that knowledge to work for our loyal clients. We have been in the SEO game since 2009 getting results for clients, which is why we confidently refer to ourselves as industry experts. Additionally, we spend hundreds of hours a year and lots of money on continuing education regarding SEO, going to some of the top conferences in the country and even speaking at some of those conferences. In addition to experience, you may ask questions about how ROI and KPIs (key performance indicators), will be tracked with hiring a San Diego SEO Expert. Those who are working and excelling in the SEO field should have great systems in place to track campaign performance and allow for their clients to track ROI of the SEO efforts they have put in place. Whether it’s tracking sales, phone calls, or some other conversion event, SEO experts live and die by data and generally have systems in place to share key data with clients. This is an important point to hit on when interviewing a SEO agency that may be doing work for your company. Last, asking what CMS (content management systems) the SEO company is accustom to working with will be important. Not all CMS are the same and some have unique challenges that if the SEO company doesn't have experience with, can be detrimental to gaining results. WordPress SEO Experts are generally adaptable to a variety of other CMS environments, but some CMS options like Manto, Wix, and Square Space are very different, so it will be important to ensure that your SEO of choice is comfortable working in the platform where your website is housed and that their systems will translate to that CMS. In the end, we all like working with people that we trust and can get us results. 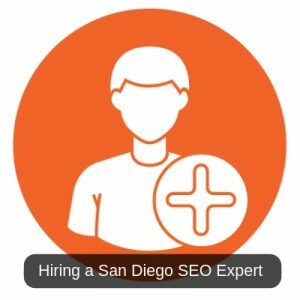 While there is a lot that goes into hiring a San Diego SEO Expert, these are some great questions to ask right out of the gate. Hope it helps!